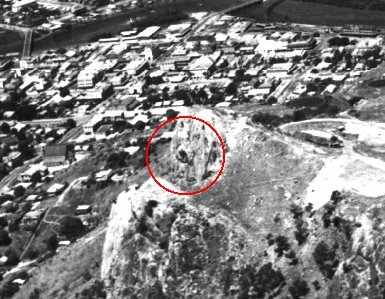 I have recently received information from an ex RAAF member regarding the location of an old WW2 Command Center that he had inspected at Green Street, West End inside Castle Hill in 1958. The road up Castle Hill was closed to traffic on about 12 March 1942 to ensure that the construction of military facilities such as the Green Street Bunker were not obvious. 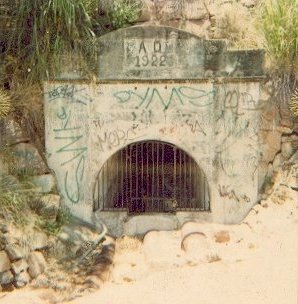 A USAFIA Command Post, located underneath Castle Hill Road, on the lower slopes of Castle Hill at North Ward was built in early 1942, possibly just after the road was closed in March 1942. The USAFIA Command Post is still there and is in very good condition with two large entrances. 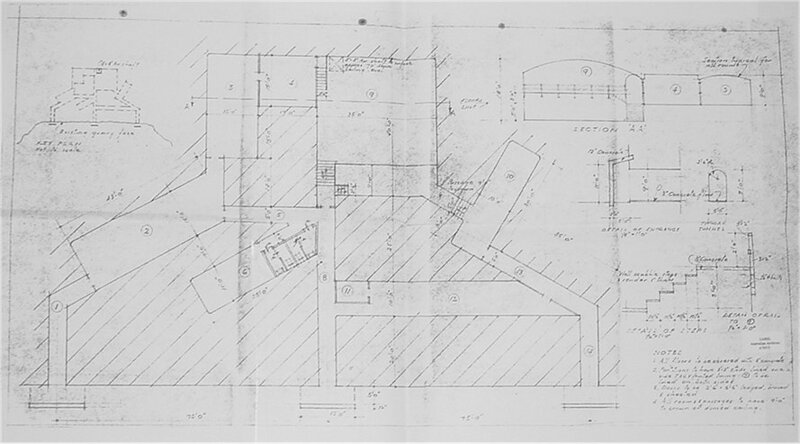 The erection of the above-ground Green Street Bunker (Project 81) at West End (near Sidney St.) was approved on 12 March 1942. Were there other underground bunkers (Command Centres) or tunnels under Castle Hill? 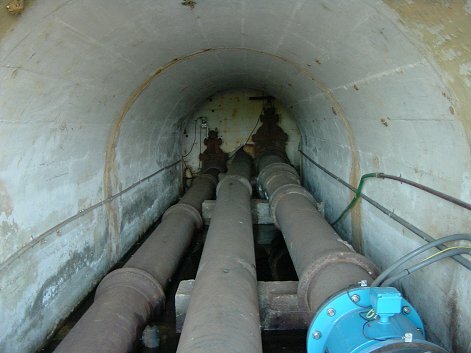 There are stories about a tunnel at the Green Street bunker site. There have been stories of a bunker inside Castle Hill near Bundock Street and Sturt Street. 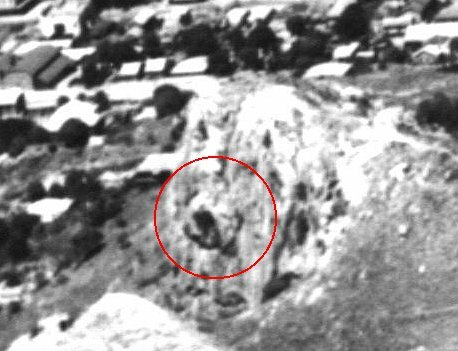 I was told by someone of 2 tunnels at the base of Castle Hill which started from the basement of the Officer's Mess for North East Area Command HQ in Sturt Street. The Officers Mess building later became the RAAF Recruiting Centre in Sturt Street. He said that he had entered the tunnel that went to the basement of Buchanan's Hotel in Sturt Street and it is unclear where the other one went. There was a flight of stairs down to the entry to these two tunnels. There were no indication of the tunnels found when the adjacent Commonwealth Building was refurbished. This building was used as the North Eastern Area Command HQ and is located between the Officer's Mess building and Buchanan's Hotel. Could this be a plan for a bunker in Castle Hill? I have heard a story that approval was given for the construction of an underground Area Combined Headquarters in Castle Hill in 1943. One of the problems is that many of the wartime infrastructure in northern Australia were built by civilian contractors (such as ex Mayor of Thuringowa Dan Gleeson) and their records are not available. That is if they ever had any records at all. There would have been many machine gun positions around the lower ridges of Castle Hill during World War 2. 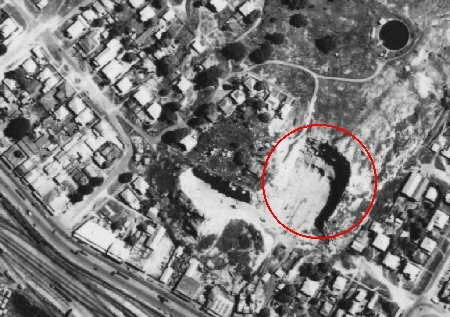 I was told of some in the Yarrawonga area and above Smyth Street at Belgian Gardens and of one directly above the Tobruk Baths on the cliffs below the houses. 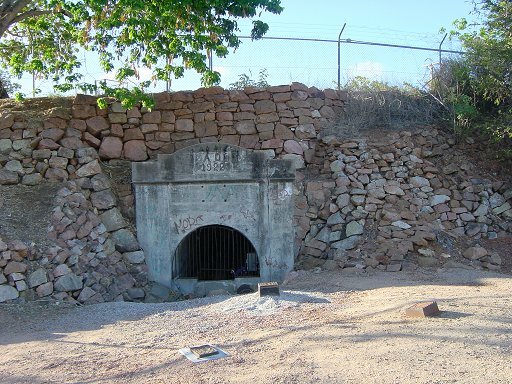 It has been suggested that a tunnel may have gone through Castle Hill and exited near the Townsville General Hospital. Possibly built as part of an early defence scheme for Townsville. Probably just another one of the many urban myths! Is this an entrance to a tunnel into Castle Hill? Highly unlikely! Now used as a "drain outlet"
This feature is located below the 2nd water tank below the start of the "Goat Track"
Colin Henschke of the 9th Australian Advanced Workshops AEME was told that the Americans were contemplating or had actually begun excavating a tunnel under Castle Hill. The reason given by the Americans was to save travelling time from one part of the city to another. However, it was not completed. Apparently they had started pulling out and were not then there in such large numbers. Has anyone heard about this story? On 26 June 2000, George Redding from 36 Squadron RAAF told me that he remembers going to an area on Castle Hill for an interview at the North East Area Headquarters for the RAAF. George said that all the top brass were right up there on Castle Hill. I am aware that the North-Eastern Area Command headquarters was located in the Commonwealth building at 24 Sturt Street, Townsville. So were there extra facilities associated with this command organisation on or inside of Castle Hill? Was it located at Greet Street or near the semi-fortified stone buildings at West End. I received a phone call from Bill Fraser, Kenmore from 36 Squadron RAAF on 23 July 2001. He also went to North East Area Headquarters for an interview. He indicated though that it was located on the foothills of Castle Hill in the West End area. It was a very secret location and was well camouflaged. He also said that while they were based at the Stock Route Airfield they were billeted in some houses at Hermit Park. Bill did not remember any underground buildings in that area. I received a phone call from Wal Moore, Caloundra of 36 Squadron RAAF on 25 July 2001. Wal told me that he went for an interview with North East Area Headquarters at a site in Sidney Street, West End. He said it was a very well camouflaged and secret location. Wal's wife, Fay, was a WAAAF who was living at the WAAF barracks in Anne Street and was taken daily with a cook to the Officer's Mess near the Sidney Street bunker. 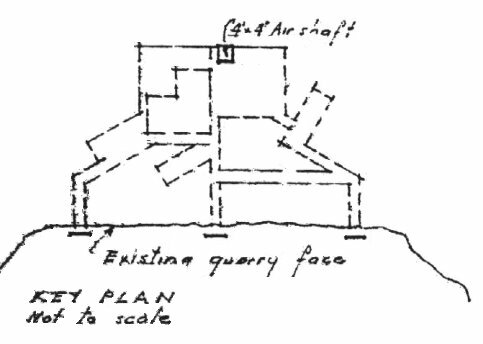 Fay advised that the bunker at Sidney Street was a Signal Station for North East Area HQ. 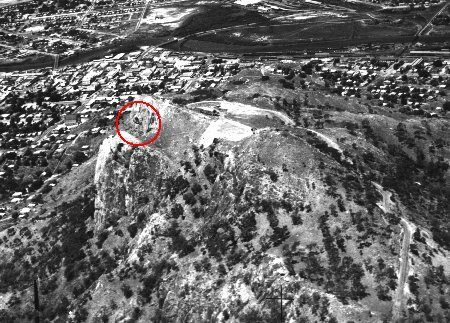 She also advised that the Headquarters for the Signal Station was located nearby, camouflaged into the side of Castle Hill. Fay's recollection from almost 60 years ago was that this HQ was about 1/4 of a mile up the slopes of Castle Hill and slightly more towards the Belgian Gardens side of the hill. Was this the WW2 Command Center for the Combined Operational Intelligence Centre that was located near the Green Street bunker? Or was it located perhaps at the semi-fortified stone buildings at West End. Or somewhere else? An aunty of a friend of mine used to be the driver for Colonel F.R. North in Townsville. Colonel North was the Commander of TOWNFORCE, one of the 3 main Forces allocated the task of defending Townsville. My friend's aunty told her family that Colonel North had his office inside Castle Hill. A former member of the Combined Operational Intelligence Centre that was located inside Castle Hill near the Greet Street Bunker told me that Colonel North had an office at the top end of Denham Street in the city. Can anyone tell me more about where Colonel North had his office inside Castle Hill? 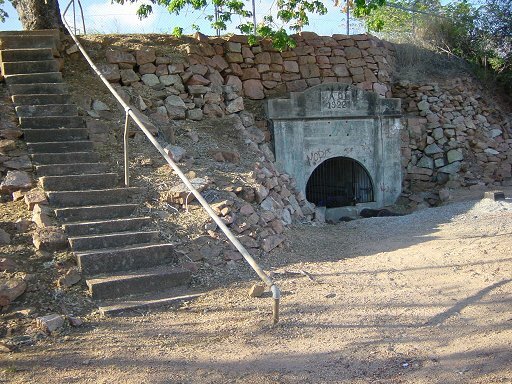 There is yet another story that there was a tunnel from the Victoria Street Bridge in the centre of Townsville that took you up inside Castle Hill. This tunnel was referred to as the "Red Brick Tunnel". There are in fact at least two red brick tunnels that probably date back to pre 1900 times. The other one runs the full length of Stanley Street. 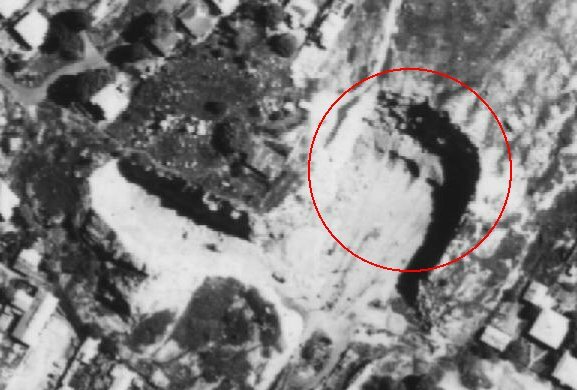 for buildings or other new tunnels during WW2? 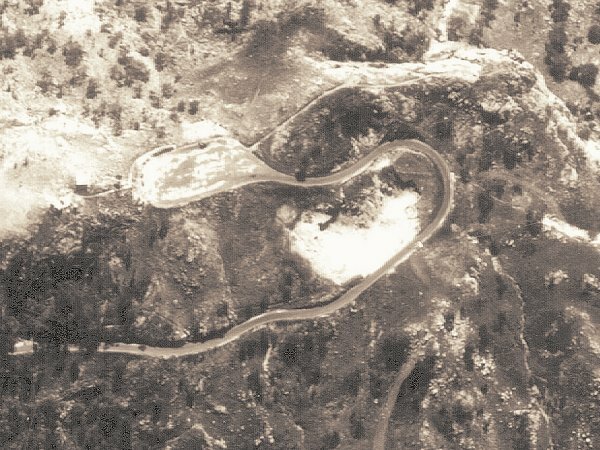 "Fortifications, command post, engine room, and searchlight emplacements were also constructed on Signal Hill. 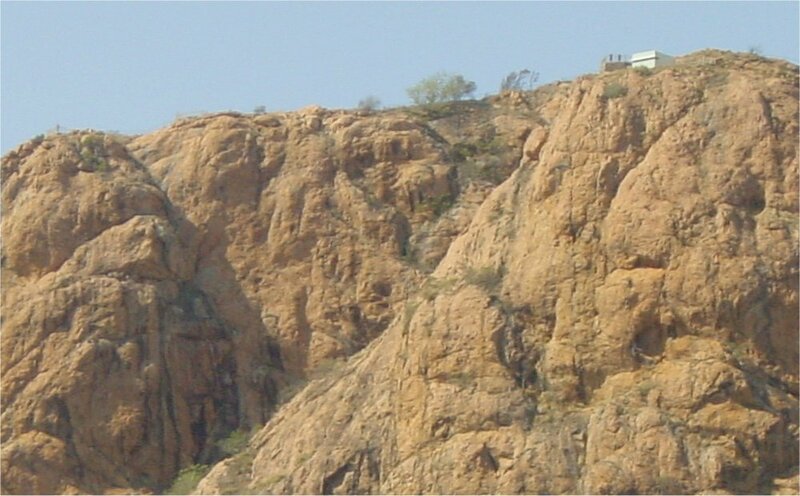 The site selected for the command post was on a pinnacle of rock on the crest of Castle Hill. This necessitated a long and heavy haul of material and men to the parking area at the top of Castle Hill. Thence the material had to be man-handled along a goat track to the site of the job. All concrete had to be mixed by hand and formwork and concrete placed in a very restricted area with a vertical drop on three sides." Could the following be associated with this Command Post? 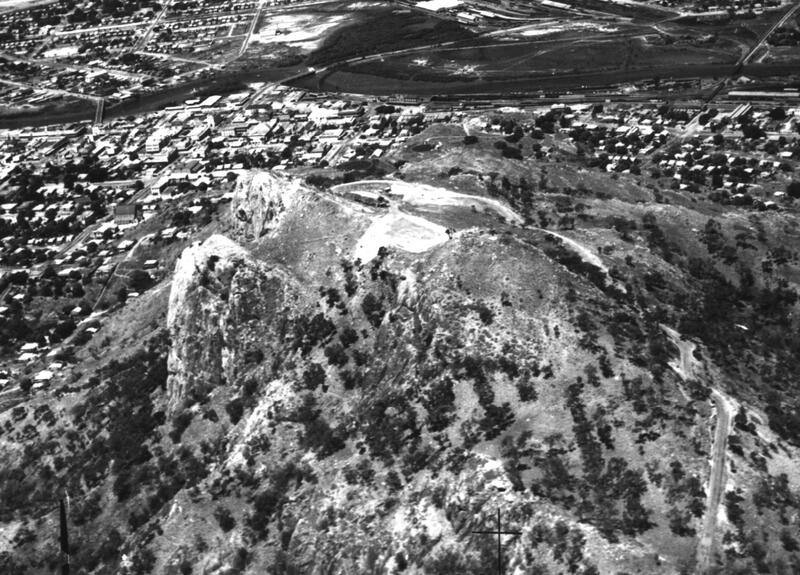 Castle Hill towards the end of the war. 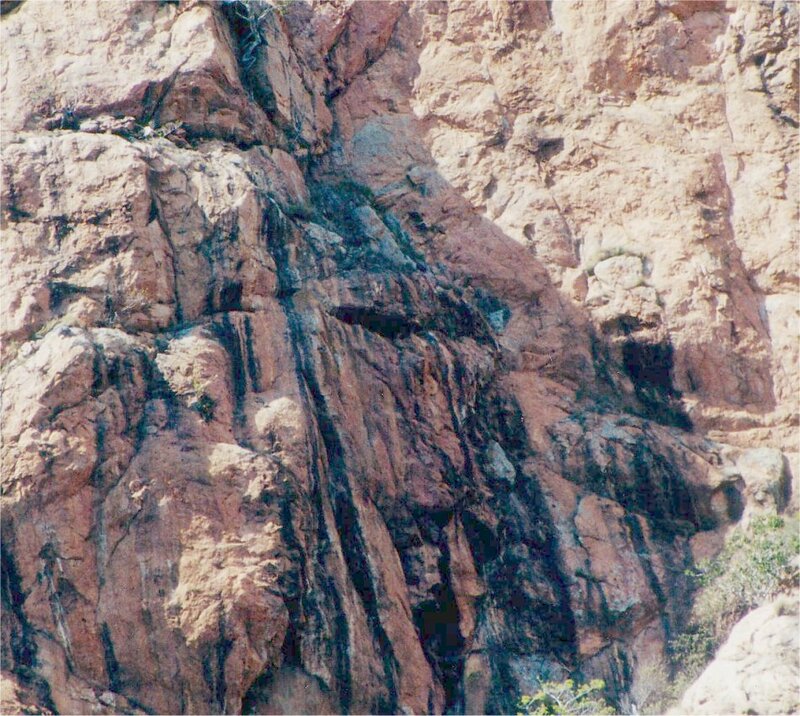 The interesting aspects of this photo are the tent or building on the top of the hill and the strange structure that is sticking out of the cliff face. Could it be either a shade cover for a viewing port or an air scoop? The photograph was sourced from a 1952 photography run by the Townsville City Council and the photos are available from the Department of Natural Resources Brisbane. What are these holes for? Were they used during the 2nd World War? some other form of bomb-proof underground bunker? 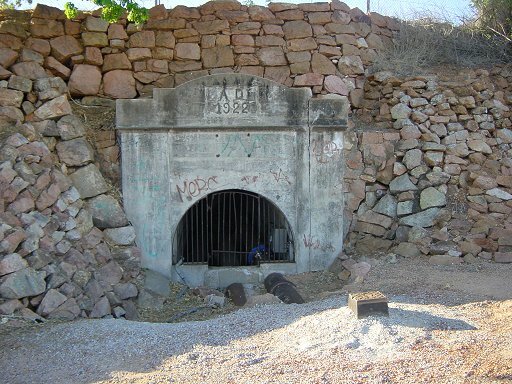 Was the US Army Corps of Engineers or the US Navy Seabees involved in constructing these Tunnels or bunkers? In a 31st Battalion Newsletter, Barry Smith mentions that he was part of a party sent to Princess Charlotte Bay by Sunderland flying boat to investigate the possibility of a Japanese submarine using a refuelling base in the area. On his return he reported to Combined Defence Headquarters in Sturt Street. Where was this HQ located? BRISBANE, Tuesday. 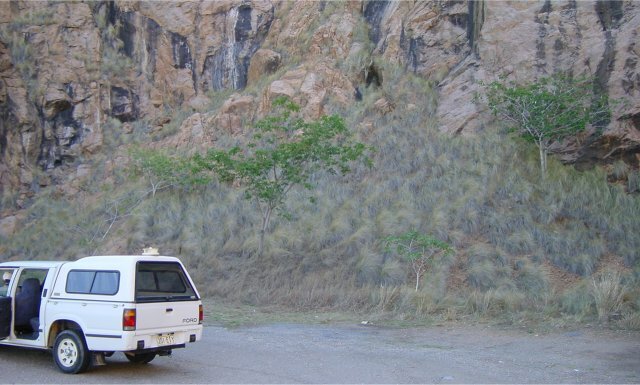 - It is reported that a gold-mining claim has been pegged out on Castle Hill, near Townsville by Messrs. Rooney and Doig, who are said to have received encouraging results from a preliminary prospecting of the sites. Does anyone know where these gold-mining claims were on Castle Hill? at the base of Castle Hill?